Gold - 1850 - the world focused on Ballarat as the cry ‘gold’ echoed around the globe. People from all nations poured into Ballarat to seek a fortune; many found the real Australia and decided to make this great land their home. Today, you too can capture the excitement of these bawdy times as you visit the scene of revolt, rebellion and the emergence of democracy at Eureka and Sovereign Hill - Ballarat. Ballarat wildlife park is a high standard, well-planned fauna reserve affording excellent opportunities to ‘mix’ with native Australian animals. Nestled in a native bushland habitat, get up close to many of the Australian animals such as kangaroos, koalas and emus. If you are yet to have an Australian wildlife encounter, you will definitely be impressed with Ballarat Wildlife Park. Join a guided tour and meet our friendly kangaroos, shy koalas and Tasmanian devils. 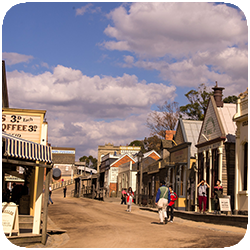 Continue to Sovereign Hill, an authentic re-creation of the 1850's gold mining town of Ballarat. Take in the atmosphere of Main Street, try gold panning, take the Red Hill Mine tour, explore the Chinese Village and visit the Gold Museum. Note: Sturdy walking shoes are recommended due to uneven and sometimes slippery terrain.